Will a New Arena Significantly Impact the Maple Leafs? Sometime in 2014, there will be a shiny, new, NHL-ready arena open in Markham, Ontario, a city of 300,000+ (2011 Census of Canada) located just north of Metropolitan Toronto (in what is commonly known as the Greater Toronto Area or GTA). 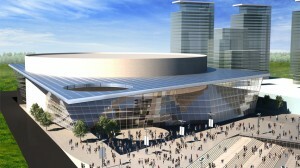 The arena is the brainchild of Graeme Roustan, chairman of Bauer Performance Sports Ltd., as well as Chairman and CEO of GTA Sports and Entertainment ULC (the entity behind the arena), and by all accounts will provide an economic boon to the area, from 600 construction jobs and almost 900 jobs associated with the arena. No doubt a new arena means more competition among area venues for acts to fill the calendar. Concerts, conventions and other events could well choose Markham over downtown Toronto. But the key issue for many is what major tenant would find themselves the occupants of this new arena. The GTA has AHL hockey, owned by MLSE and playing in their own venue at Ricoh Coliseum. An OHL franchise could help. But for many, Markham’s arena opens the door to a potential second NHL franchise in Southern Ontario. That kind of talk has been around a long time. Southern Ontario remains one of the hottest hotbeds for hockey in North America, and desire for a second team has been at the forefront since 2006 and Jim Balsillie’s bids to bring the Penguins, Predators and finally Coyotes to the Hamilton or Kitchener-Waterloo areas. The Ontario Junior Hockey League, a junior ‘A’ league a level below the OHL, consists of 26 teams, half of them within an hour’s drive of the Air Canada Centre. Last season, the league saw average attendance of 245 people (admittedly, the teams in the Metro Toronto area draw the fewest fans). There are also three university hockey teams, a number of junior B and C teams, in addition to the numerous youth, men’s and women’s instructional and recreational leagues. Suffice to say, the GTA is well-served at all levels of hockey, with varying degrees of success when it comes to in-arena attendance. But the appetite and audience for hockey seems to be there. Still, for a new, state-of-the-art NHL-size arena, it’s unlikely anything less than an NHL team will provide the necessary revenue-generating usage to make it viable. In that vein, the discussion about a second GTA-area team turns to how that second team would change the market. An argument is made that another team in the market – one that plays ‘winning hockey’ – would start to draw fans away from the Maple Leafs, and have the spin-off effect of forcing MLSE to do a better job of building a contender. That idea supposes that MLSE is not actually committed to improving the Maple Leafs in the first place. 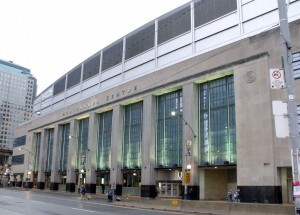 There’s long been a theory that since ACC (and previously Maple Leaf Gardens) were perennially sold-out, there was no impetus on MLSE (or previous ownerships back to Harold Ballard and Steve Stavro) to pay for the best players or build a winner in order to keep the fans happy. Ballard allowed many very good players to leave because he would not pay, and Stavro once refused to acquire Wayne Gretzky because he didn’t figure it would sell any more seats than not having Gretzky. The evidence would suggest to some extent that it’s true; winning is not essential to filling a Toronto arena for NHL hockey. To delve into whether MLSE actually cares to build winning teams, or has tried, is a subject for another day. It’s hard to know if a Markham-based team would draw fans away from the Leafs. To begin with, the Leafs are traditionally oversold at home, and it’s well-known there is always huge demand for tickets, as well as a long waiting list of corporations and individuals looking for season tickets. That’s in a multi-cultural market, in which every Leaf game is available on television through a combination of over-the-air, cable and specialty channel services. As noted above, it’s a market served by the AHL, Canadian university hockey, major and minor junior leagues, and numerous recreational and instructional leagues for people of all ages. There is no lack of ‘other hockey’. There is so much hockey, it’s the central pillar of the argument the area is capable of supporting another NHL team. Furthermore, the Leafs manage to sell out in a market that like many other cities, has numerous competitors for the entertainment dollar: Major League Baseball’s Blue Jays, two CFL franchises, 4 other NHL franchises within a 6 hour drive, an NFL franchise within a 3 hour drive, and like many other major urban centres, a vibrant theatre and performing arts industry, numerous major concerts, etc. In other words, the Maple Leafs are able to compete for, and some would say win, the battle for the public’s disposable income. Whether people come because they love the Leafs, or are fans of other teams, or because they love hockey, the point is they spend their money on hockey. A second team is likely to give more people more chances to spend on hockey, rather than force a choice of one team over another. Markham’s team will draw from York and Durham Regions (representing about 2 million residents), and fans from the northern parts of Toronto may choose to travel to Markham. The addition of a major rail link (proposed as part of the development) will help. There’s no doubt that these areas do hold population enough to fill 20,000 seats 41 times a season. But, according to the 2011 Census of Canada, almost 4 million of the GTA’s 6 million residents live in the regions of Toronto or Peel – and the Air Canada Centre is the easier venue for those residents to travel to and from. Studies have shown GTA residents experience some of the longest commuting times in North America, recently found to be 80 minutes round trip. Certainly, a new arena in Markham will attract fans who work in the area, and will attract those who live in the area. For the guy who works in Toronto’s downtown, or lives in the Beaches, or the Mississauga parent who wants to take his kids to a game, it’s highly unlikely they would be drawn away from the ACC – it just doesn’t make geographic or economic sense. Would a better team in Markham draw fans out of Air Canada Centre? There’s no guarantee the team that winds up in Markham won’t be an equally poor performer on the ice. After all, who are the candidates to occupy the arena? The Phoenix Coyotes seem ready to move, and recently had a great season. But let’s not forget this is a franchise that has made the playoffs only 8 times in 15 years in Phoenix, and won a grand total of 2 rounds… More than the Leafs, yes, but hardly a premiere, contending, elite team. Further, he Coyotes could be destined for Quebec. Other teams with recent poor attendance include the Islanders, Stars and Blue Jackets – teams that seem unlikely likely to relocate and are not currently elite teams. It would seem highly unlikely that an expansion franchise, should one ever be granted, would have the pull to seriously affect the Leafs – at least not until the expansion franchise had achieved some degree of success on its own, which may take a few seasons. Another supposed spin-off of a second NHL team raised is it would drive ticket prices down. The Maple Leafs have incredible demand for tickets, and have a large number of season’s tickets sold to corporate accounts. So a second team would double the availability of tickets for NHL hockey in the region. NHL hockey in Toronto isn’t cheap; the lowest priced ticket for any Leaf home game is $55CDN, and ranges up to $450CDN for a seat on the side rails at a premium game. It’s far more likely that a second NHL franchise would see the Leafs’ pricing as the established market value. The Leafs can charge between $55 and $450 per seat, wouldn’t the owners of a similarly located franchise price themselves accordingly? Why would they leave significant money on the table when the market has shown it will bear the higher prices? And then there’s the LeafNation factor. The Maple Leafs have a history, dating back to the birth of the NHL. People have great-grandfathers who had seasons’ tickets, or were employed building Maple Leaf Gardens, or lived on the same street as this player or that one. Of course there are fans who have grown weary of the mediocrity that has come from the Maple Leafs in recent decades, and have moved on to other teams. And there are those who would love nothing more than to see another franchise take MLSE down a peg or two. But with fans continent-wide, the Leafs have a fairly secure fanbase at this point. 1. The Maple Leafs, though relatively unsuccessful in the last 40 years, have 95 years of history, numerous Hall of Famers in their past and 13 franchise Stanley Cups. Some among the fanbase are generational – they grew up as Leaf fans and probably will stay Leaf fans. 2. The Maple Leafs own their own means of broadcast. LeafsTV is currently a premium channel which provides exclusive broadcast of about 15 games per season, in addition to numerous features on the team and reruns of other Leaf games. Additionally, MLSE was recently purchased by Rogers Communications and Bell Media, Canada’s two largest entertainment providing entities. Rogers and Bell not only provide internet, television and mobile delivery systems, they also own Sportsnet and TSN/TheScore, the two major sports content providers in Canada. It would suggest that the Leafs will continue to be a fixture in any programming package available to the public. A new franchise may find difficulty getting good exposure in their own market. 3. Though good transit and highway access will benefit the occupants of the new arena, the Air Canada Centre is linked by a walkway to Union Station, the nexus for Toronto’s subway and the area’s GO train service. In that respect, the ACC and the Leafs will likely always be the preferred venue for those living and working in downtown, as well as for fans coming from the more populated suburbs west of the city (particularly Mississauga). Without doubt, the Greater Toronto Area could support two NHL franchises. The population base is there, and it’s a population that is hungry for hockey. Markham’s arena may be a little closer than people would have imagined another team would situate themselves relative to the Leafs. Perhaps Hamilton (metro population of over 700,000) or Kitchener would have made sense. Only, there are no current plans to update Hamilton’s Copps Coliseum or build an NHL-ready arena in the area. There will be competition for acts to fill dates. For many, the viability of the Markham arena rests on securing a major tenant, and the NHL seems to fill the bill. Don’t expect MLSE to start shaking in its boots though. Naturally, some fans would adopt the new team, and some will prefer the new arena whether based on geography or another reason. A second team in Southern Ontario will only help satisfy a need in an under-served market for NHL hockey, not significantly divide the pool from which one the league’s most financially successful teams draws on.